You are here: Home / Crap Shoot / Groupon for Gunnies! GearHog.com! 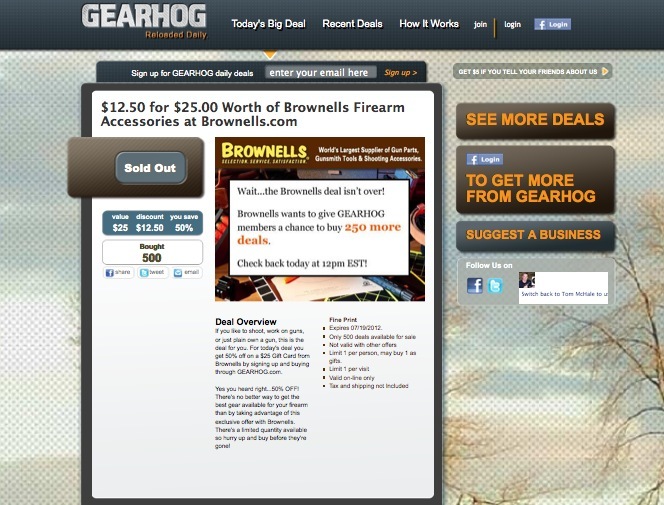 If you forward the deal to a friend, and they buy, you get $5 in GearHog bucks for your next purchase. So far, the Brownells was the best deal. Since then, it’s been a bunch of remanufactured ammo, slightly lower than factory new, and ‘deals’ that can be easily matched or beaten with a 2 minute web search…or in a couple cases are maybe 5% below regular pricing (while they mention the MSRP to boost the supposed % off). The idea is great, I just wish they’d had some better reputable offers signed up before kicking it off as they’re damaging their reputation…most of the ‘deals’ aren’t even picked up on the deal hunting sights, and those sights get just about anything like this posted.